Piyali Sadhukhan’s mixed-media works, sliding between drawing and sculpture, are robust, tenacious beings with whom you would trifle at your own peril. At one level, they belong to the family of quotidian domestic props: wall hangings, throws and rugs. But they could equally belong to the dark forest of the subconscious where a sacrifice is raging, where the prey hunts or haunts the predator, where the umbilical cord is both vestige and noose. What looks like a Persian carpet or a Kashmiri namda, from a distance, erupts into open sores on closer scrutiny. The eye focuses on a pattern made of broken glass bangles; on wounds that refuse to be stemmed; on a carpet hanging like a flailing self from the wall. Something uncanny transpires in the physiognomy of this object. It screams, breaking the symmetry of the floral pattern into a sound wave, amplifying the escalating violence against Indian women in general and the Kashmiri people in particular, who have been colonized by the Indian state. This violent disruption in an ornamental pattern could be interpreted as an expression of what I have elsewhere called the ‘politicality of abstraction’. It emerges when political provocations hack into abstraction’s repertoire of formalist devices, including repetition, seriality and the stable grid, questioning their implicit rigidity and authoritarianism. 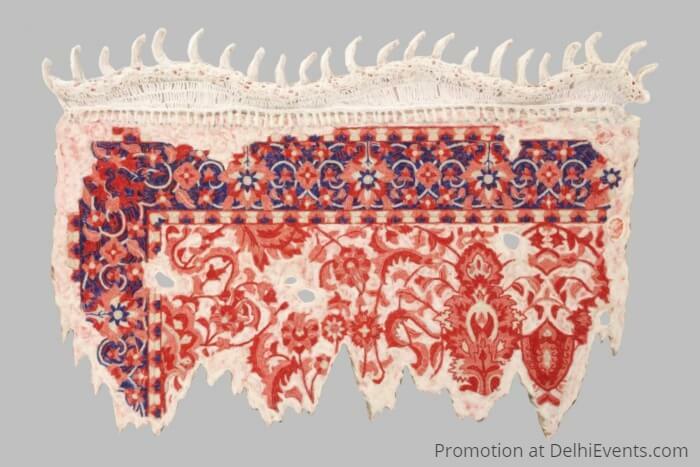 While the uterus is camouflaged in the broken-glass carpet design in one of Sadhukhan’s works, the pelvic bone and spinal cords are rendered in crochet as stand-alone triggers of power and woundedness in others. By politicising the domestic crafts of embroidery and crochet, Sadhukhan demands acknowledgement of women’s labour, which is undervalued or made invisible. One of the most stunning works here is a response to the Sabarimala crisis of 2018, when an all-male community of devotees barred women from entering the temple, claiming their presence would pollute the precinct of the celibate god Ayyappa. This shimmering altarpiece exceeds the artist’s intent. While her feminist position is manifested in the threateningly cowled patriarchal figures, a censorious male god and a uterine carpet, this work also embodies a primal moment of theatre, with its solitary central figure counterpointed by a choric ensemble. Sadhukhan brings, into the white cube, the baroque, synaesthetic impulses of her expanded practice as an art director for theatre and an artist-designer of Durga Puja pandals. I would contend that Sadhukhan’s works reclaim the melodramatic, not in the manner of conventional Hindi films, but in the sense in which Mani Kaul parsed Ritwik Ghatak’s films, as “open[ing] the idea of melodrama to the pain of history”. Kaul alludes to Ghatak’s Partition history. I would take his insight a step further and interpret melodrama as an alternative space for a poetics of polyphony, a layered articulation of affect in the face of trauma, which refuses to be narrowed into the stark binaries of the political.